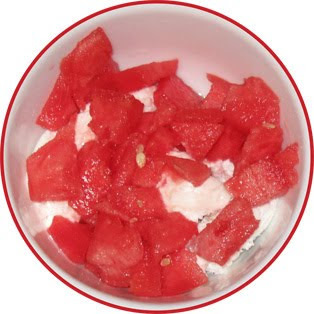 On Second Scoop: Ice Cream Reviews: Topping = Watermelon ??? My apologizes, I had every intention of running a Friday night fight tonight, but I'm afraid this week has burned all my energy. Instead, I humbly present some ice cream torture: How do you make ice cream healthy? Add fruit! I've said it before, and I'll say it again and again: You have to fun with your food! Underneath is the last of the BB Alpine Strawberry and on top is some very tasty watermelon. I know it's out of season, but it had that great red rich color in the store and I couldn't help myself.